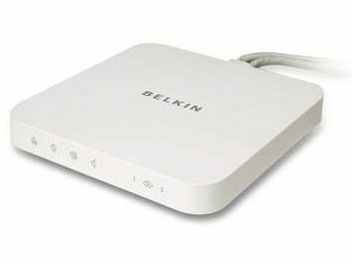 The Belkin Switch2 is a networking box for anyone wanting to view two Macs through a single monitor. Both Macs can be on at the same time; the switch simply divides the signal so you can choose which Mac to view. When you want to switch the display to show the desktop of the other Mac, just push the button on the front on the Switch2 and the other Mac's signal is displayed. It's all very easy to set up. There are powered USB ports for a keyboard, mouse and a headphone jack, and these cut in to work on either Mac when the switch button is pressed. The unit's shell apes the form of a Mac mini and it's designed to stack under one - which it does perfectly. But this doesn't mean it'll only work with Mac minis; in fact, a Switch2 will link up any other Mac or PC, although you might need to buy a VGA adaptor, depending on the port configuration on your machine. These adaptors ship with Mac minis, so spare adaptors don't come in the Switch2 box. Thankfully, this hardware doesn't require any software installation at all, but you will need to coordinate the resolution and display settings of your two Macs so that they display the same-sized desktop. As far as configuration goes, that's about it. The controls are all on the front of the switch box, which has a touch-sensitive front panel. On the right-hand side is a button for switching Mac signals; to the left are other basic function buttons for raising and lowering volume, muting and ejecting discs. If you have a couple of Macs and only one monitor, this is a useful piece of kit. Instead of buying two cheap monitors, you could roll your resources into one decent model, such as an Apple Cinema Display. Or, if you buy a new Mac, with a Switch2 you needn't buy a new monitor to run both your old and new machines at the same time. You can simply view both on your existing display.